This is the lowest unlimited mobile internet plan ever! Add on to the existing plans of Sun Cellular. You can even use your mobile phone as a modem (tethering). So, get rid of that sun usb modem of yours. I'll definitely apply for one. Can’t survive a day without surfing the net? Now, you can stay connected anytime, anywhere! All you need is your Sun phone and a cost-efficient Mobile Internet service. 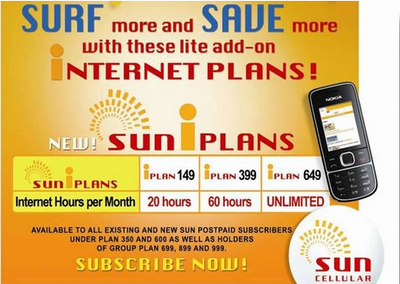 Avail of Sun Cellular’s latest offer - the Sun iPlans (Mobile Internet Plans). These new add-on data plans are intended to fit your budget and web surfing needs. Sun iPlans are available to all existing and new postpaid subscribers under Plan P350, P600 or any of the Group Plans (P699, P899 and P999). Because Sun believes that you should be able to maximize every centavo of your hard-earned money, the Sun iPlans are designed to allow subscribers to enjoy mobile Internet at considerably lower rates. You have three plans to choose from: the iPlan 149 that gives you 20 hours of surfing, the iPlan 399 that lets you enjoy 60 hours of mobile Internet, and the iPlan 649 that allows you unlimited web browsing—all valid for one (1) month. With these plans, you can get up to 95% discount! Imagine, your usual P10 per 30 minutes is slashed to only P3.73 with iPlan 149, P3.33 with iPan 399 and P0.45 with iPlan 649. Here’s more! With an iPlan, you can even use your Sun phone as a modem to connect your PC or laptop to the internet! Simply attach your Sun phone to your computer, open the PC Suite, and using ‘minternet’ as access point name (APN), connect and enjoy browsing while on-the-go. Sun iPlans are guaranteed to provide you all the convenience and pleasure in surfing the net for your personal and professional needs. You can even update your status and browse through your social networking account, send and receive important emails while on a trip, and research for a school or work project even outdoors with only a Sun phone on hand. Apply now for your choice of Sun iPlan at The Sun Shop nearest you! For an advanced credit evaluation, inquire via phone by calling the Sun Hotline 200 using your Sun mobile phone or (02) 395-8000 using any landline. that is just 400kbps gprs/edge connection max. not 3g/3.5g compared to smart or globe. Do you have any written/documented reference that i can check ?